Five years ago, an 11,000-pound steel collar slid down the boom of a crane high above a construction site on East 51st Street, forcing the crane tower to topple over. Six construction workers and a woman visiting in a building a block away were killed in the accident. But even as dozens of lawsuits from the incident are still wending their way through court, the Manhattan real-estate market is moving on. Two sites damaged by the falling crane are being reborn as new tall apartment buildings: One is named the Halcyon, evoking happier and more peaceful days. That building—whose amenities include a 50-foot-long pool and a golf room and interiors designed by S. Russell Groves—is due to go on the market in early July, seeking to take advantage of rising interest in East Midtown condos, brokers said. It has 123 condominium apartments, including one- to four-bedroom units, along with large penthouses. The condo plans value the units at $341 million, or $1,768 a square foot. After the accident, the city’s Department of Buildings, revoked the building permits it had previously issued for that tower, saying it didn’t meet technical requirements of the zoning code. But that project went into foreclosure and was bought by Mr. Feldman in 2011 after he had purchased the debt on the property at a significant discount, he said. Mr. Feldman then purchased additional property next door that allowed the construction of a shorter—but much broader—building at 305 E. 51st St. that wrapped around from 51st Street to Second Avenue. The building has a total of about 307,000 square feet of space, according to city filings. The new glass-and-steel building will be somewhat shorter at 32 stories, but will include two four-bedroom duplex penthouses with private terraces and three-bedroom duplexes with terraces on lower floors of the building. CIM Group, a Los Angeles-based real-estate company, later became an investor in the project, property records show. Tricia Hayes Cole, executive managing director of Corcoran Sunshine Marketing Group, which is marketing the building, said that since 2008, the East Midtown neighborhood has begun to attract more upscale families, as well as influx of international business people looking for pied-à-terres. That led to a design that includes more “life-style amenities,” she said, and finishes such as walnut paneling, travertine flooring and bronze detailing. The pool and some other amenities were put on the 22nd floor in a light-flooded space. There is a communal terrace with barbecue pit, children’s room and exercise spaces. Prices range from $1.3 million for one-bedrooms to more than $10 million for the most expensive penthouses. 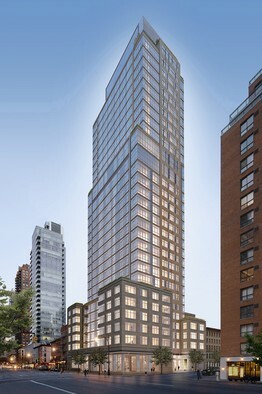 One block over on East 50th Street and Second Avenue, Fishman Group, an Israel-based company, has won approval to put up a 140,000-square-foot, 28-story building with 54 apartments and some commercial space. The new building plan includes the site of a townhouse crushed by the crane’s jib where a visitor from Florida died in the 2008 accident. Yehuda Mor, an executive vice president at Fishman, said that though the city has approved building plans designed by Cook + Fox Architects for the site, the project was still in its early stages and cost estimates were still being worked out. The crane collapse on East 51st was one of two fatal crane collapses in 2008, amid a construction boom that led to a series of investigations and new testing and safety requirements for crane operators, and other changes in construction rules. The families of the seven people who died in the collapse reached settlements, but other actions are still pending in state Supreme Court in Manhattan. At the Halcyon, demolition work is now under way, and the building is due to open in 2015. Mr. Feldman’s HFZ Capital was aggressive during the downturn in acquiring a number of mortgages and properties where condo developments were stalled. He acquired the debt on One Madison Park, a 50-story tower on Madison Square Park as well as the debt and control of the Setai Wall Street condominium on Broad Street in Lower Manhattan.